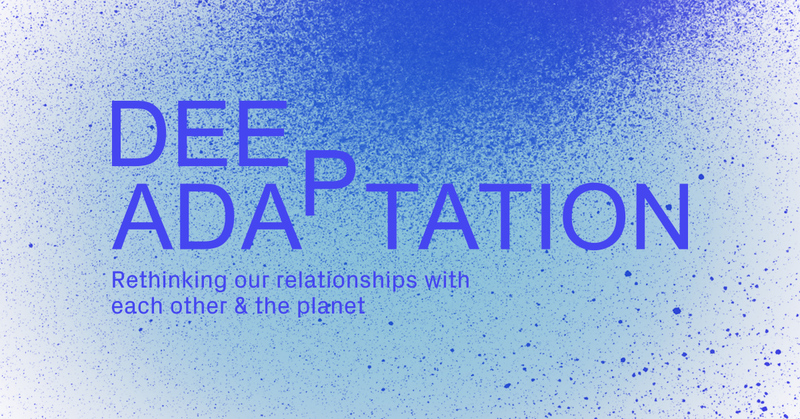 Deep Adaptation is an ongoing programme of commissions, talks, screenings, workshops and events exploring how current social, political, civic and economic issues can be understood in relation to climate change. In thinking about climate futures, we have been engaging with the work of Jem Bendell who has begun to explore the need for Deep Adaptation. Like many people, we are not experts in these issues, but are embarking on a process of collective learning to deepen our understanding through conversation, action and creativity. As a group of artists and activists based at The NewBridge Project, we are keen to move these ideas forward, and are asking questions about necessary changes that are required on an individual and local, as well as a national and global, level. We are aware that it isn’t only about what obligations we have, but also our capacities to act – in this programme, responsibility is rethought as “response-ability”. Alongside a programme of events, Deep Adaptation will present work by artists Rhona Foster, Alex Lockwood, Chad McCail and Lucien Anderson and David Lisser who are working in collaborative ways to explore these ideas within Newcastle and Gateshead. The exhibition will act as a public space for people to respond to, and reflect on ideas of deep adaptation, producing a collaborative response to issues surrounding climate change. For information about each of the commissions please visit the links above. Amidst the noise of the daily news cycle, the significance of statistics stating that if our current level of consumption continues we will require seven more planets, or that the earth’s temperature looks set to increase by more than two degrees leading to catastrophic climate change, can be difficult to grasp. However, these truths (and more) speak of an impending global ecological disaster that we can’t afford to ignore. We recognise that many of the crises we face today can be understood within this framework of climate disruption. We also believe that the current neoliberal system offers little hope for the kind of changes that will be needed and, further, it has the capacity to worsen the harm done to the earth, and impose greater suffering and oppression on the many in order to protect the power and wealth of the few. Whilst there are some serious questions that must be asked with regards to our current norms of behaviour and habits of consumption and production, we also realise that there are opportunities for change, for alternative narratives/visions to emerge. This may offer new hope and new opportunities for living differently and less extractively with our natural habitat. Are current eco habits only for the well off? Do they only work to create new habits of consumption? And if so, what can be done to challenge and change this? How does human centrism shape our understanding of the environment, and our responses to climate change? What is relinquishment and how do we support ourselves and others as we ‘let go’? How can we begin to imagine alternatives? How far can we go in reimagining our abilities to respond to what can feel overwhelming, distant, and relentless? Do narratives of “response-ability” help? These conversations cannot end here. There is an urgency for a response to events as they happen, but there is also a need to prepare for the long-game – this is a marathon, not a sprint. We need to foster a practical conversation, one that acknowledges discomfort, embodies varied agendas and recognises privilege, breaks down silos and, ultimately, creates a space for a new kind of growth. This enquiry follows on from Hidden Civil War, a month long programme of activity in Newcastle upon Tyne, commissioned by The NewBridge Project. Throughout October 2016 we invited activists and artists to contribute to a series of events that exposed, collated and presented evidence of a Hidden Civil War in Britain today. Deep Adaptation is a collaborative project, commissioned by The NewBridge Project and developed in partnership with Lydia Catterall, Taryn Edmonds, Chris Erskine, Lauren Healey, Julia Heslop, Hannah Kirkham, Alex Lockwood, Hannah Marsden and Julie Tomlin.